Leonard Nimoy (left, Spock on "Star Trek") and daughter Julie at Nimoy's place in Lake Tahoe (between California and Nevada), which Nimoy later had to sell, as chronic obstructive pulmonary disease made it too hard for him to stay at that elevation. Family members of the late Leonard Nimoy — Spock, to millions of "Star Trek fans" — are trying to raise half a million dollars for a documentary about the lung disease that claimed his life earlier this year. "COPD: Highly Illogical - A Special Tribute to Leonard Nimoy" is expected to be released in February 2016, regardless of the funds raised, but there is an active campaign on FirstGiving.com that now has about $203,000 pledged, including a $200,000 donation from Novartis Pharmaceuticals. The campaign concludes Nov. 30. David Knight and his wife, Julie Nimoy. Julie is the daughter of Leonard Nimoy, famous for playing Spock on "Star Trek." Knight and his wife, Julie (Nimoy's daughter) first conceived the documentary after Nimoy gave an interview to television personality Piers Morgan in February 2014. Nimoy had been spotted by paparazzi in an airport using a wheelchair and supplemental oxygen, Knight said, and wanted to go on the air to talk about the condition that was killing him. COPD, or chronic obstructive pulmonary disease, is a condition in which a person has trouble breathing, and it gets worse over time. Symptoms of the disease include wheezing, coughing or chest tightness, according to the National Heart, Lung, and Blood Institute. 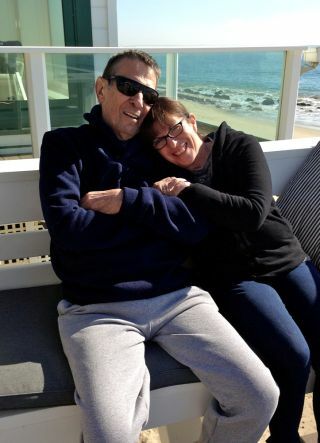 Leonard Nimoy (left, Spock on "Star Trek") and daughter Julie in Malibu, California. Nimoy, who was a smoker but quit decades before he was diagnosed with COPD, spent the rest of his life raising awareness about his condition, Knight said. It was around U.S. Thanksgiving in November 2014 that Knight and his wife approached Nimoy about doing the documentary. "We talked to Leonard first about it, and he gave us a lot of encouragement," Knight said. "It was something he thought was really a great idea. Unfortunately, at that time, his health was changing." The film will focus on COPD and will include an animated voyage into the body using the USS Enterprise, the ship that Nimoy was first officer on in "Star Trek." There will also be interviews with doctors and other experts on COPD, which is one of the leading causes of death in the United States, Knight said. Leonard Nimoy (Spock on "Star Trek") and family friend and actress Arielle Kebbel wearing "I Quit" buttons, representing the decision to quit smoking. Nimoy's death this past February was "a sad time" for the family, Knight said. It has already sparked two tributes: Besides this documentary, Nimoy's son Adam is directing a more "Star Trek"-focused film called "For the Love of Spock," which raised more than $600,000 on Kickstarter this year (warping far past its goal). Adam Nimoy is also directing "Highly Illogical," which will be made by Knight's and Julie Nimoy's production company, Health Point Productions. The production company previously made a documentary called "Microwarriors: The Power of Probiotics" (bacteria and yeast that aid digestion) that was directed by Adam Nimoy and narrated by Leonard Nimoy.